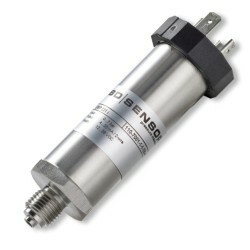 High performance transducer with adjustable scaling for modifying the pressure range for different applications. Ranges from 0-60 bar up to 0-600 bar gauge or absolute. The DMP333i has an all stainless steel 316 construction which includes a repeatable high precision silicon strain gauge sensing diaphragm. The precise output from the silicon chip sensor is further linearised and optimised for temperature errors with digital processing amplifier. A high resolution 16 bit analogue to digital converter is used to convert the raw silicon sensor output into a digital signal which is then compensated over pressure and temperature prior to it being converted and amplified to the output signal range. One of the benefits of a combining high accuracy with a digital amplifier is the ability to re-scale the analogue output to suit the application whilst maintaining a relatively precise measurement with a significant turn-down ratio. The output amplifier can be configured precisely via a communications kit which includes transducer configuration and RS232 interface cable. I need to measure 0-350 bar accurate to 0.5 bar in the 30-70 bar range? The 400 bar range is accurate to 0.1% (0.4 bar) at room temperature, plus 0.2% (0.8 bar) temperature error band over -20 to +80 degC, so as long as the temperature is not varying too much a 400 bar range DMP333i should be very close to your required accuracy. Do I need the RS232 option? You do not need the RS232 unless you want to re-range the DMP333i output span or offset the zero reading. We will be using the transducer as a reference for a variety of test benches as part of our monthly calibration routines. Is it possible to provide the DMP333i with a calibration certificate? As standard a calibration report is included with this sensor at no extra charge. However if you want a more formal certificate, a UKAS certificate can also be offered as an alternative, but there will be an extra charge. We have a pressure transmitters that we wish to replace that has an accuracy of 0.08% full scale BSL, the DMP333i high precision pressure transmitter looks very close to what we need, but the accuracy quoted for it is 0.1% FS according to IEC 60770, limit point adjustment (non-linearity, hysteresis, repeatability). Please could you explain the difference. BSL stands for best straight line and this method produces the best number for most devices because it is derived from the average of all the errors and is not tied to any particular measurement point. This is particularly useful when you want to achieve the best accuracy possible by adjusting the zero and span settings so they coincide with the BSL. However this is not a very convenient method for calibrating a pressure transmitter especially in the field during installation since it often means that the zero and full span of each transmitter have to be offset by different amounts. A more practical method is the limit point adjustment or terminal straight line method (TSL) where the accuracy is referred to a line which is drawn between the zero and full scale output reading. 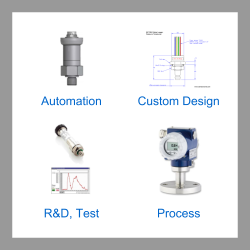 A limit point adjustment accuracy enables the specifier to determine whether the pressure transmitter will meet the required accuracy by simply setting the zero and span output to the required pressure readings without any special offset adjustment per device. A 2 to 1 ratio is typically used to compare BSL and limit point adjustment accuracy specifications. This is because the measurement output points often follow a curve shape profile, so when using the limit point adjustment method, most of the points lie on one side of the line, whereas using the BSL method there would be an even distribution of points either side of the line. In this particularly case the DMP333i accuracy can be halved to 0.05% FS when comparing it to the other pressure transmitter accuracy spec of 0.08% FS BSL. Please select the options you require for the DMP333i Rangeable High Pressure Precision Transducer in your application and request a quote. Send us your enquiry for DMP333i Rangeable High Pressure Precision Transducer to get assistance with this product type.